Diana Elizabeth Jordan has been conquering adversity since the day she was born. Her doctors had to work on her for 45 minutes before she started breathing on her own. Diagnosed with cerebral palsy (which mildly affects her speech and gait) at age two, she grew up with a tenacious spirit and would not to let anything stop her from pursuing her lifelong dream of being an actress. Beginning her acting career in her native Chicago after graduating with a Bachelors Degree in Theater and Media Arts from the University of Kansas, Diana has always been determined to not be limited to being cast in only disability specific roles. She has been cast in over 30 plays, numerous short and feature films and appeared in The WB’s 7th Heaven and FX’s Legit. One of her proudest moments was in 2001 when she became the first actor with a disability to receive a Master of Fine Arts in Acting from California State University Long Beach. Diana launched her creative arts and production company The Rainbow Butterfly Café (creating Artistic Treats to nourish the mind, heart and soul) through which she produces her one woman show Watch Your Head (by Lynda Rodriquez) in 2014. She has spent over 15 years coaching actors with disabilities at Performing Arts Studio West. 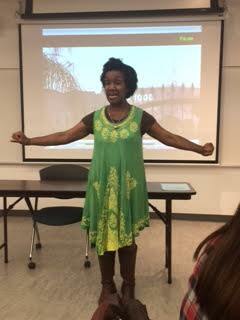 Ms. Jordan has been speaking publicly about her experiences living as an African American with a disability since she was in high school. As an inspirational speaker and artist educator she is committed using the arts as a transformational tool to speak to and mentor youth, empowering them to achieve their goals and dreams. She created the interactive motivational goal setting program “D.A.R.E. T.O. D.R.E.A.M. Your Possible Dream, 11 Tools To Consider When Dreaming Your Possible Dream” and she has been a guest speaker at elementary, junior high and high schools, colleges, universities, and disability-related organizations. Diana adopted the term “Performance Artivist” because of her passion for acting and commitment to activism and social change. She advocates for creating equal employment opportunities for performers with disabilities and for ensuring that disability is included in dialogues about diversity and equality in the entertainment Industry, corporate America and that disability history and culture be taught in schools. She has served on the SAG-AFTRA National Performers with Disabilities Committee and she was the 2011-12 West Coast Chair for The IAMPWD Campaign (Inclusion in the Arts and Media for People With Disabilities), a three-year national civil rights and public relations committee sponsored by SAG-AFTRA and Actors Equity to increase employment opportunities and visibility for people with disabilities in the Entertainment Industry. Using humor, honesty and compassion, Diana is committed as an Actor, Artist Educator, Inspirational Speaker and “Performance Artivist” to changing perceptions about disability, diversity and inclusion through her dynamic workshops, speeches and performances. Diana resides in Los Angeles and when not acting enjoys playing her favorite role Aunt Di to her adorable nephews James Wesley and Jordan Gregory.